Captured History, a new series from Capstone, asks the question: Can a photogragh change the world? 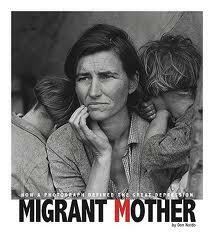 In Migrant Mother, Nardo examines the photo that defined The Great Depression. Taken by Dorothea Lange in March of 1936, Migrant Mother has been viewed as perfectly capturing the meaning and the desperation of the people most affected by The Great Depression...the poor. Nardo, a prolific author of well-researched history books for children, traces the events that led up to Lange taking the picture, the woman who was photographed, and the long-lasting impact that that picture had on American society. It is an interesting idea for a book. Then she saw hand-written letters on a sign by the side of the road that, 20 miles later, had her turning around. It was at this camp where she saw a woman and her four children sitting under a crude tent. The session was informal and lasted about 10 minutes. Lang shot six pictures. She was in a hurry and didn’t even get the woman’s name. Within days of arriving back in San Francisco, Lange sent some of the pictures to the newspapers and by March 11, 1936, her photo, Migrant Mother made headlines. As a result of that picture, and public demand, the government sent 20,000 pounds of food to that the pea pickers’ camp located in Nipomo, California. Lange died in 1965 and never did learn of the identity the woman whose face she made famous. That face belonged to Florence Thompson. Nardo gives us a brief, but thorough history of how Thompson ended up in the camp that day. We also get a brief over view on the causes of the Great Depression. The book has four chapters: Snapping an Iconic Photo, A Nation Fallen on Hard Times, To Capture the Careworn, A Truth as Old as Humanity. Each chapter is lavishly illustrated with period black and white photos that are captioned. There is a Timeline, Glossary, Additional Resources, Source Notes, Selected Bibliography, and index. Nardo covers a lot in just 64 pages. Nardo ends the book with an interesting comment. “No matter how photos like Lange’s are used later, their original meaning is never lost.” I question if that is true. I fear the original meaning of photographs, and that of protest music that ends up advertising products or streams as Muzak in stores, will be lost if we do not have books like this one to educate a new generation to their social impact and importance.